Layla loves her pre-work Photizo session! So easy, it’s child’s play! 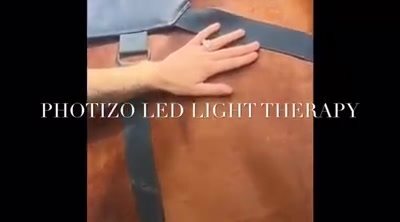 This is why my team all use PHOTIZO LED LIGHT THERAPY. From training with Mary Bromiley I was taught to feel with my hands and by treating six horses or six riders on average per day, I would like to say I am now pretty good at that. So I am admittedly a bit of a skeptic with new therapeutic machines. However, I absolutely love having my Photizo, and even now I am still finding new areas and conditions it can help me treat. It is perfect, as it is so easy to use alongside working with my hands, which for me is key! 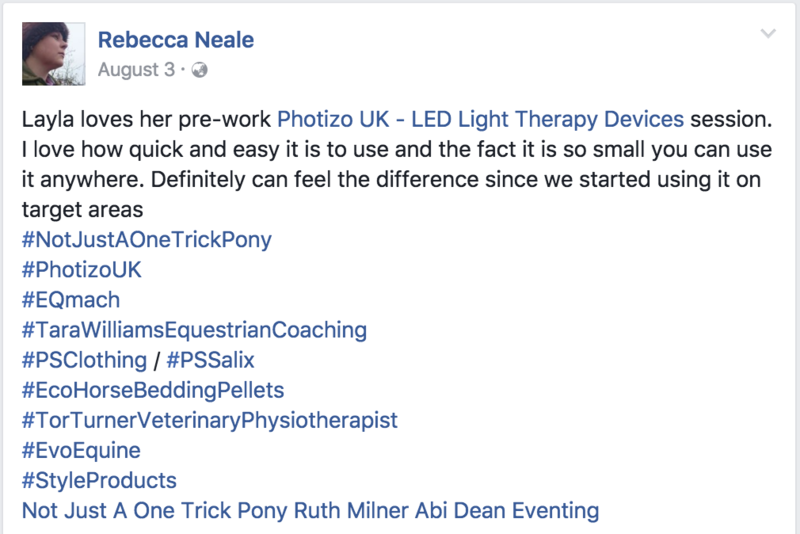 A prime example is that I have recently had two elite dressage horses with incredibly ‘tight’ polls, of course due to this being a very sensitive area they were not to pleased with the pressure from my hands, so I used the Photizo. I was absolutely amazed as they both really found it very relaxing and then afterwards it enabled me to work so much deeper. 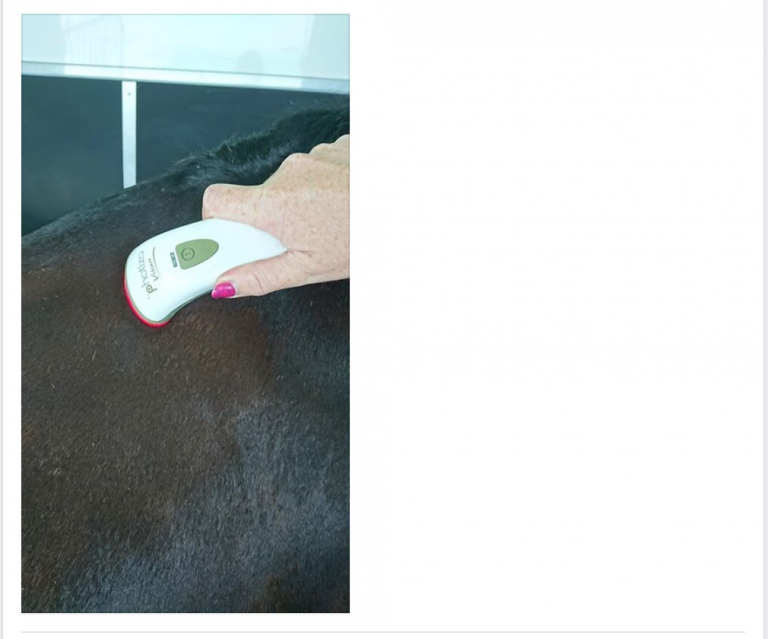 These particular horses are often checked by a leading vet and ridden by a professional rider, of whom both were astounded at how different the muscles felt and the horse went after treatments. I also use it on muscle tears to help soften the muscle tissue in the initial stages before I work on it manually. I really can’t recommend it enough, thank you! The Photizo I used on my English Bull Terrier did wonders for his skin rash. He has a bad medical condition where his skin on his belly and under his legs would flare up and itch uncontrollably.  After using the Photoizo I saw an immediate difference. After just a few days the rash had completely cleared up and hasn’t returned. It was the only thing that really helped, and I can tell you I tried everything. Thank you very much for an awesome product! 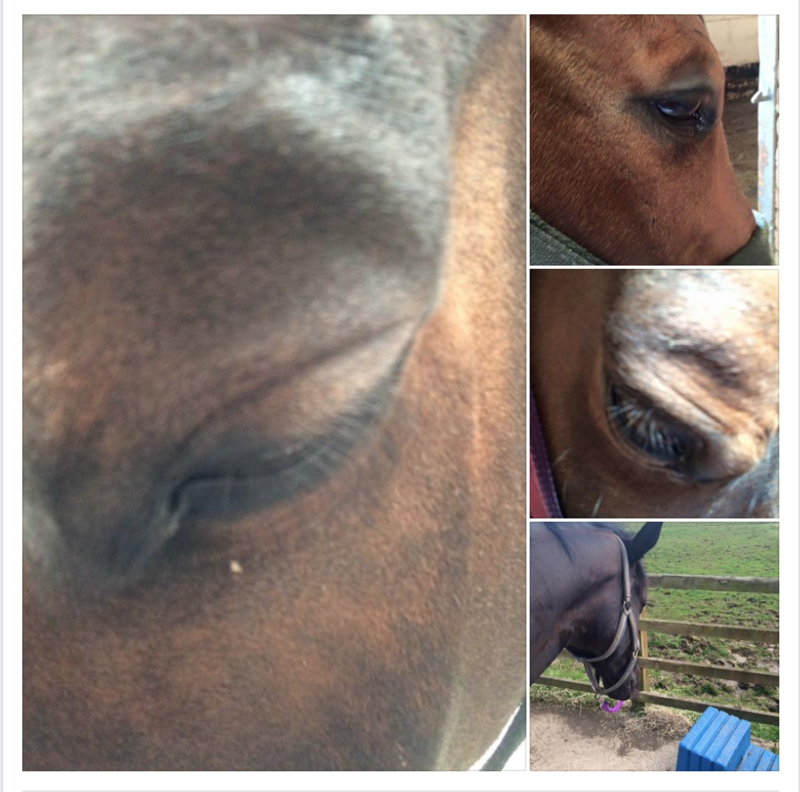 The horses already had their first treatments and they love the hands on care. A Bemer is so impersonal! They just stand there and graze while the treatment takes place. With the Photizo they get the treatment and human interaction at least. I’ve owned my 22-year-old mare, Lace, since 1997 and have had many problems keeping her sound due to a pre-existing injury. After many years of trying everything on the market I decided to hire the Photizo unit. It really is a miracle machine. After only a week’s use the trauma tissue has virtually gone. 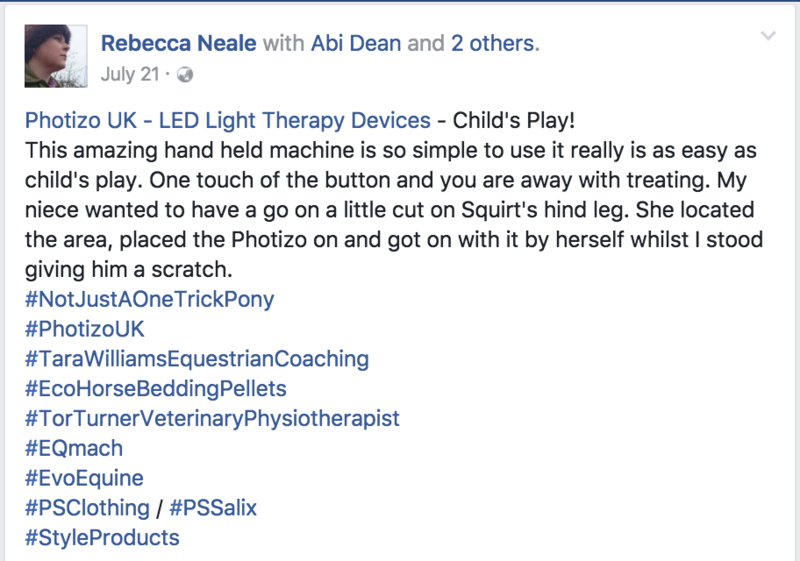 I also use it myself as I have osteoarthritis and we are both now out and about winning shows, pain free and very happy. 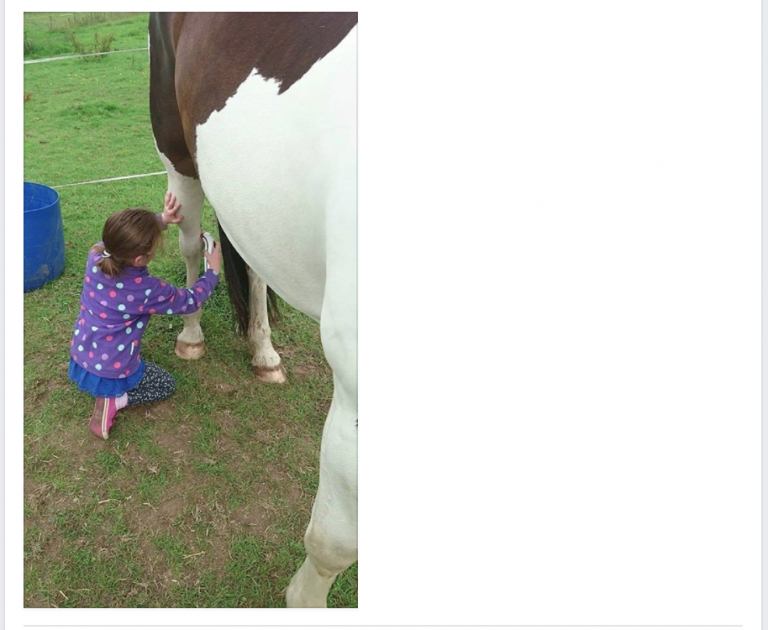 Anja was diagnosed with hip dysplasia (HD) when she was 3 years old. She went to the vet and, a year later, to a specialist vet when it seemed like she was having more difficulty with her movement. He said that Anja is like a person with arthritis. When she gets up she is very sore and stiff, but after she has walked a few steps, she gets better. He said there is no need right now to keep her on medication or look at any operations. The pain is not there all the time, only when she gets up from a down position and initially when she starts walking, and only at night. She gets a joint supplement and is on veterinary joint food, which definitely makes a difference. Anja is mostly sore in the evenings, and is usually more sore after she’s been running around a lot, like after we’ve been to a park. In the winter she was worse. I started using the Photizo on Anja every day. I treated her on both her left and right sides, from the spine down on each side. I treated her hindquarters. After about a week I could see a difference. She could get up quicker and more easily. She was also limping less and loosened up quicker when she started walking after she got up. I did get a bit lazy and after about 2 weeks of treatment I stopped for a bit. I could then see her getting sorer again – getting up slower. That also showed me that the Photizo definitely made a difference. I then started treating her again.